a what? Why would I want a sewing machine pincushion? 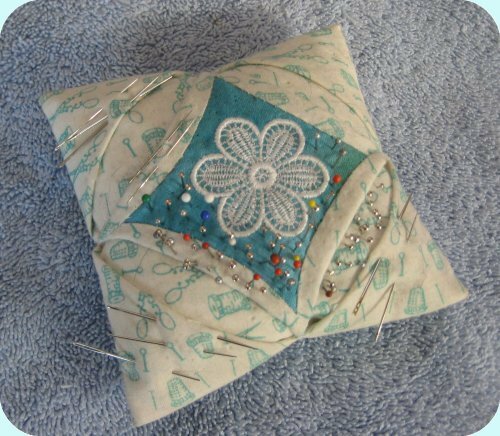 After all, I have a lovely, lovely pincushion that I received in my goodie bag at one our our Arizona Retreats. I used to use the bottom half of a travel soap dish (the top half having sprouted legs and walked away). I didn't realize how much a pincushion was *useful* until I got this one! So, thank you, Arizona Hostesses! I also have a small Cathedral Window pincushion that I occassionally use. I made this one to practice making a hand-pieced Cathedral Window square using a sample of a machine embroidery design and decided to make a pin cushion out of it. I don't really use it that much. 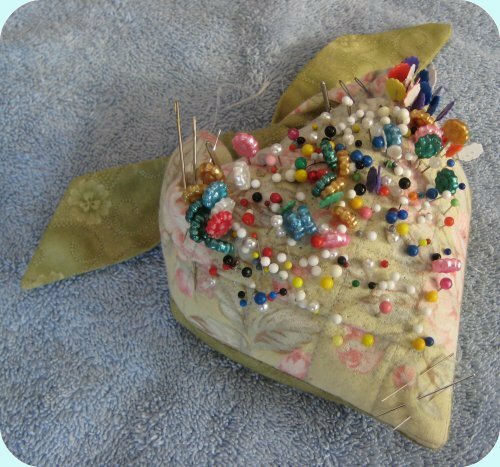 Then, I ran across an archived blog for sewing machine pincushions from Kathryn at I Can Find The Time blog ... way back in July 2010. I don't even remember if she reposted it, if someone ELSE reposted it or if I found it myself (probably on the way to looking for something else completely!). But ... Kathryn has come up with the most AMAZING, useful, practical pincushion! Having this sewing machine pin cushion *right at the machine*, out of the way, but still in a fixed position completely solves the problem of not having a secure place to put the pins as I remove them from whatever it is that I am sewing. I know *exactly* where that pin cushion is; I know it isn't going to move around; I know it isn't going to fall on the floor. Whereas Kathryn secured her pin cushion with a ribbon tie, I used a wide grosgrain ribbon and Velcro dots. 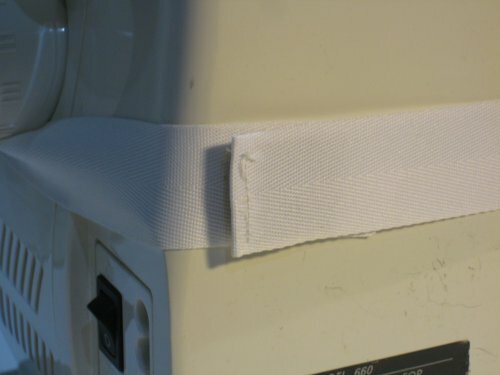 It turned out that I really didn't need the elastic after all; I'm able to pull the grosgrain ribbon quite snugly and the Velcro dots provide the necessary adjustability. 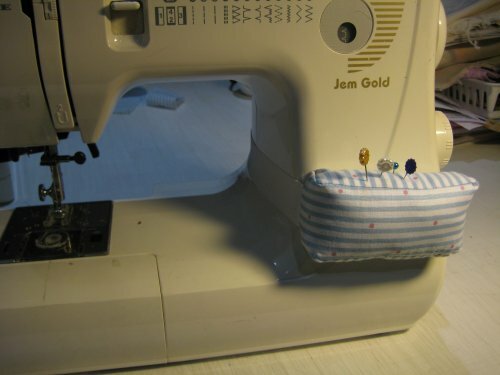 I liked the idea so much, I made another one for my Janome Gem Gold, which is the machine I take to classes (my Janome 6500, while being a terrific machine, is a *bear* to lug around). 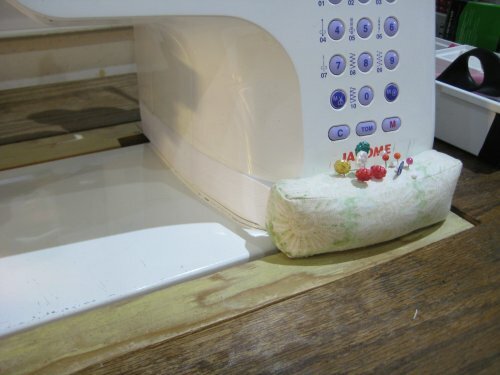 Now, both of the machines that I regularly use have attached (but removable) pincushions! I'm so pleased! Kathryn came up with a winner of an idea and I'm so glad that I found her blog entry! Thank you, Kathryn, for being so imaginative!